The sessions are led by ng homes Cultural Officer Michael Kam (seen here on the far right) with the group at Tron St Mary's Church in Red Road. 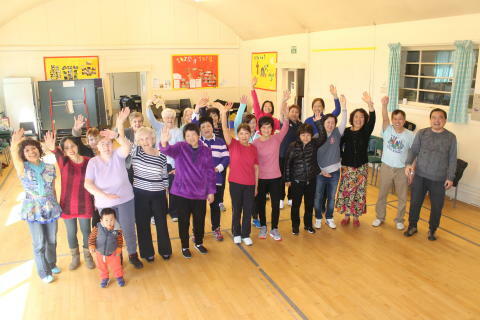 ORIENTAL exercise classes run by ng homes are proving popular with Scottish and Chinese people as they work together to get fitter in North Glasgow. 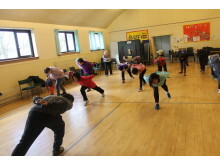 The weekly sessions take place on Friday mornings at Tron St Mary's Church at Red Road in Balornock between 10am-12noon and they are led by ng homes' Cultural Officer Michael Kam who is well skilled in Oriental Exercise. 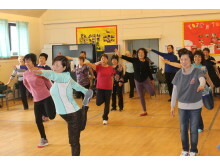 The sessions are well attended by both Chinese and Scottish people and local resident Agnes Cooper said: "I have been attending the exercise classes since the beginning, everyone is really friendly and I enjoy the company." Hongping He, a Chinese resident living in Springburn said: "I really enjoy the oriental exercises and I hope it continues for a long time, its a great way to make friends and keep fit." Oriental Exercise is an alternative way to work out but ultimately achieves the same end result of building good health. It does not require intense exercise but instead emphasises the way to have strength in blood vessels and the nerve system in order to keep blood flowing normally and smoothly in the body. ‘Taichi Chuan’ is a very popular morning exercise among Chinese people. However, the complicated steps of Taichi Chuan and long hours of practice discourage beginners and they find it difficult to maintain the exercise consistently. The classes are particularly good for elderly people but people of all ages are welcome. Some improvements can been seen after a short period of time but like all fitness regular and repeated practice pays dividends. ng homes Board member Agnes Wilson who lives a short distance from the church said: "We are delighted with the popularity of the Oriental exercise classes and we would like to thank Tron St Mary's Church for all their help. Health and wellbeing is so important and these classes provide a great opportunity for people to improve their health and make new friends." Tron St Mary's Church which was the setting for a scene in Ken Loach’s award-winning movie The Angel’s Share, plays a vital role in the community and has recently embarked on a community growing project in the church grounds and wider area. 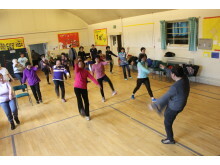 Margaret Finlay, Family Support Worker at Tron St Mary's Church said: "We are delighted to host ng homes' Oriental Exercise classes, they are well attended and its great to see the interaction between the Chinese community and their Scottish neighbours. We have a Friday Friends group where people can take part in lots of activities including a walking group and some of the participants of the exercise class have joined the walking group too so we see many benefits of working in partnership with ng homes." Oriental Exercise classes are open to everyone with no upper age limit. Contact 0141 560 6000 for more information or to book your place.